Have you ever wanted to be in Tibet during a festival? 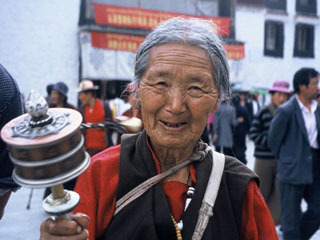 The temples and streets are full of pilgrims spinning prayer wheels like this. You don’t have to go that far to observe a Tibetan festival in Toronto, but, alas, it won’t be as colourful. There will still be monks in maroon robes and some beautiful statues of the Buddha and Tibetan saints. You will have an opportunity to meditate and chant. And you will see some thangkas or religious scrolls. Toronto’s several Tibetan temples will be celebrating the New Year of the Iron Horse on Saturday, March 5. The special, one-hour long worship service at the Riwoche Tibetan Buddhist Temple, for example, starts at 8am. This is not a tourist attraction. Leave your shoes at the door and always walk in a clockwise direction around the sanctuary. Pamphlets are provided so you can follow the chants in English, Chinese or Tibetan. Expect silent refreshments of sweet rice and tea (no talking). Afterwards, there will be time to meet Tibetans and followers of Tibetan Buddhism. This temple’s web-site explains: Traditionally, people do not eat before coming to the temple. After chanting and praying together we go downstairs and have some traditional Tibetan fare (rice with raisins, Tibetan cookies and rice beer!). This way, we have the first meal of the New Year together. It is also traditional to buy some new, never worn, clothes and wear them to the event (not mandatory, but a nice custom). It is also customary to make offerings to the lamas, monks, and nuns of the Temple when visiting on this day. The Riwoche Tibetan Buddhist Temple is at 28 Heintzman Street, one block north and east of Dundas and Keele in the Junction. Tel. 416-766-7964. For more information, e-mail: pema@riwoche.com or suzanne.gobeil@yahoo.ca. Its web-site is at http://www.riwoche.com .